FitzGerald & Sons has an ongoing commitment to fabricating as much of our product as possible in the safest most efficient process. Utilizing our 12,000 sq. 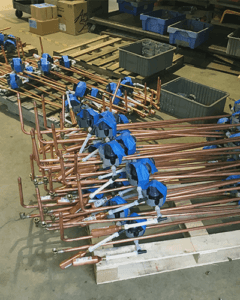 feet fabrication shop, we can fabricate and assemble much of our materials so when they arrive on the jobsite our field personnel only has to mount the assemblies in place and connect them. This reduces safety risks by utilizing a controlled environment and decreases man hours spent physically on-site.